Virat Kohli-led Team India maintained their stranglehold on the ICC Test mace for the third time running, pocketing a sum of US$ 1 million for continuing their dominance as the top-ranked Test team. With three full-fledged overseas tours scheduled, 2018 was supposed to be the litmus test for Team India after the Virat Kohli-led side had swept almost everyone that came to their shores in a prolonged 13-Test home season. The year started with the tour of South Africa where, on tough wickets, India fought hard but appalling team selections and insipid fourth-innings' batting paved the way for a 1-2 defeat. The same story repeated itself in England where India's inability to knock over the English lower-order and the repeated failures of the top-order meant Kohli's men returned empty hand and with scars of a 1-4 defeat. On the personal front, Kohli had a sensational tour. Involved in poetic violence with James Anderson, Kohli successfully put the horrors of the 2014 tour in the cold storage, smoking 599 runs across five Tests- the most by any batsman from either side. But, an overseas win still alluded Kohli. The year was supposed to be legacy-defining for Virat Kohli- the captain. But, lack of support from his fellow batsman and questionable tactics from the team management and Kohli himself had turned it into yet another year of frustration for the Indian fans. Easy wins followed against the Windies at home but all eyes were set on the tour Down Under where Kohli and the team would have a final chance to establish their credentials as a good traveling team and not just home-track bullies. The absence of Warner and Smith was yet another fillip considering Australia's inexperienced bowling and the firepower in India's bowling unit. But, India needed their batsmen to step up against the likes of Cummins, Starc, Hazlewood, and Lyon to have a real chance in the series. But, at 4-40 on the opening session at the Adelaide Oval, it increasingly looked like a 'There, we go" moment for the Indian fans. But, then, the monk Cheteshwar Pujara decided that he would bat and bat and bat until the Aussie bowlers were pummeled into the dirt. Pujara's 121 paved way for a 31-run win for India in the first Test and by the time he was dismissed for 192 at the SCG, he had faced over 1200 balls for his 521 runs and most importantly nullified Australia's quicks. Apart from Pujara, India's bowling attack- led by Jasprit Bumrah, played a crucial role in India becoming the first Asian team to beat Australia Down Under. The right-hander, who had made his Test debut earlier in the year, emerged as the spearhead of the fast bowling unit, claiming 49 wickets in 10 Test matches which included a match-winning 6-33 at the MCG. 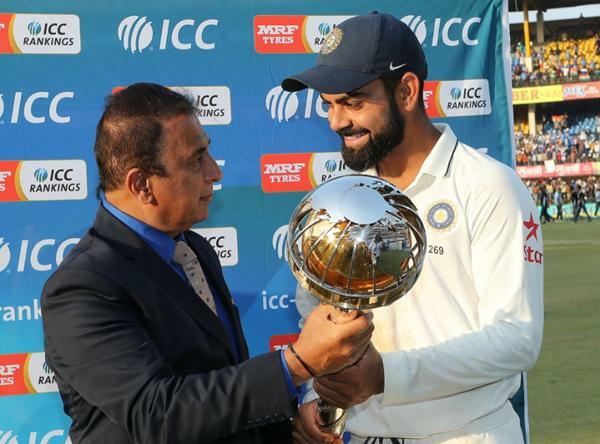 Kohli, who on multiple occasions has publically admitted his penchant towards the five-day format was naturally ecstatic about retaining the mace for the third year running. "Retaining the ICC Test Championship Mace once again is something we are all really proud of. Our team has been doing well across formats but it gives us extra pleasure to come out on top of the Test rankings," said Virat Kohli, once again reiterating his love for Test cricket. "We all know of the importance of Test cricket and of how only the best can prosper in the format," the Indian skipper added. Among others, New Zealand was rewarded with US$ 5,00,000 following their surge to the second spot in the ICC Test rankings. The Kiwis under Williamson had a great last year in Test cricket. Following a 1-0 series win at home against England, the Williamson-led unit scripted history by beating Pakistan in the UAE before humbling Sri Lanka [2-0] and Bangladesh [1-0] at home. "It's been especially pleasing to see the consistency we've shown in the longest form of the game over a decent period of time," said Williamson. Meanwhile, South Africa, who finished at the second spot in both 2017 and 2018, had to contend with the third spot following their series loss [0-2] to Sri Lanka. The fourth spot went to Australia, who pipped England following their 2-0 win over Sri Lanka and the latter humbling at the hands of the Windies. "I congratulate India on retaining the ICC Test Championship Mace and appreciate the passion Virat Kohli's team has shown across formats over the past few years. Test cricket has been enjoying a purple patch over the last couple of years with more positive results than ever and a genuine competitive balance between nations," he said. “The World Test Championship gets underway in August and will give fans greater context for all Test cricket providing an undisputed conclusion to some of the most renowned cricket rivalries in the international game,” concluded Sawhney. For the uninitiated, from August, the ICC Test Championship will get underway with Australia taking on England in the Ashes series. The competition will see nine of the 12 Test playing nations play six series over two years- three home and three away. Each bilateral series will feature at least two Tests and the final between the two best sides' will be played in June 2021.